Surprise your loved ones with a self-designed photo book - for your best memories! If you want to present and celebrate your pictures in a very special way, the Pixum Photo Book is the right choice: Create your personal photo book easily and in high quality. Awaken the creative designer in you and show what you are made of! Thanks to Pixum this becomes an experience for everyone. For those who want to personalize their photo book and also have little time, the Pixum Photo World Software offers the option of simply inserting the images automatically into your work - for more information on photo book design, see the following sections. " 1. Unlimited design options & FAQs "
Thanks to the free Pixum Photo World Software which is very easy to handle, you will be able to create a special photo book with just a few clicks. A modern technology enables you to choose and upload your favourite pictures within a few seconds and without any problems. Use the broad range of designs and layouts to order your photos creatively and adapt its sizes. Discover yourself how easy it is to collect your pictures in a brilliant and unique way - Pixum makes it possible. Get the best from your photos by using the innovative features of the free Pixum Photo Book software. Discover yourself how easy it is to collect your pictures in a brilliant and unique way - Pixum makes it possible. Get the best from your photos by using the innovative features of the free Pixum Photo Book software. If you want to hold on to special moments in an extraordinary way, Pixum is your reliable partner. The free software offers different formats and sizes to design perfect photo albums for all kinds of occasions. Turn the XXL landscape format into a high-quality wedding book, create the large portrait format as a great gift for births or birthdays and use the small version as a handy display of your short holiday. Benefit from even more features to choose from like various binding methods, different covers and a selection of paper types - your options are almost endless. If you want to create a photo book and display your favourite photos in a professional way, choose Pixum - the award-winning photo service! In the next section you will learn how to design and order in no time. " 2. Simple design for beautiful memories "
Determining the right amount of photos you need for your album isn't that easy. In general: Quality before quantity! Choose the motifs carefully and sort out all images that you are not completely convinced of. Depending on the subject of the photo book, the viewer's focus is usually on individual subjects, but you may also use collages for which you need a correspondingly larger number of images - bear this in mind when pre-selecting the images. Detailed tips and tricks on this question can also be found in this article. As you have probably already imagined, this also depends strongly on the topic of your photo book. Pixum offers you a variety of different formats - there is something for every occasion! For example, the smallest copy available, our photo book mini in landscape format, forms the perfect basis for a sweet gift idea. 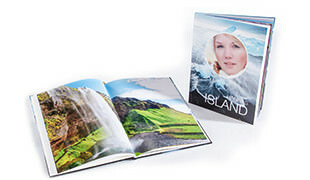 The XXL format, on the other hand, is ideal for reproducing impressive landscape and portrait photos, making your photo book an impressive work of art. What's the price of a Pixum Photo Book? From as little as £7.95, you can design your own personal souvenir at Pixum! Depending on the size, format, cover, type of paper and the number of pages in the photo book, this price changes accordingly. Choose your favorite from three available formats and up to four different sizes. In the free Pixum Photo Book Software you can experiment with different settings and change them at any time. You can find an overview of all prices in our photo book price list. Choose your desired format: At Pixum you can find different portrait and landscape formats and can also create a square photo book. The sizes of the book range from mini and small to square and large to XXL format. You have the choice: From the sturdy hardcover photo book with glue and Layflat binding through soft and linen cover bindings to premium linen - optionally even with high-gloss finish. Premium quality papers: From extra matt, matt and glossy paper to real photo paper, everything is included for your printed copy. On up to 154 pages your smartphone pictures will find a perfect place in best quality. Additionally you can choose between different topic photo books: Discover great image and text templates and clip art elements that you can combine with your images to create your own personal photo book. 2. What do you use to design the photo book? We recommend the free Photo World Software, which you can simply download and install on your PC or Mac. 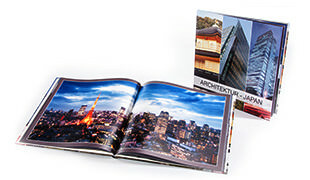 Design your photo book with ease and creativity. The Photo World software is also easy to use for people without previous knowledge: Choose from a wide variety of layouts and backgrounds, insert individual texts or use the layout and text suggestions provided. Many Pixum Photo Books can be additionally finished with a glossy foil finish so that your pictures are presented even better. Alternatively, the online design is available directly on the Pixum website. The online designer also offers many individual design options and makes it easy to store your photo book creation temporarily. If you appreciate mobility, use the innovative Pixum Photo World App to design and insert your smartphone images directly into the book! Once you have finished designing your personal photo book, you can order it easily and cheaply in one simple click. The printed photo book will be sent to you within a few days. Furthermore, you have the possibility to order your work again or to put it online as a photo book. Share your unique Pixum Photo Book with your family and friends. Benefit from the countless possibilities of Pixum Photo Books and create an original photo book for as little as £7.95 - quick and easy according to your design ideas. You can rely on tested Pixum quality! Get inspired: In the Pixum Photo Book Tips and Ideas section, you will find many examples of how you can personalise your photo book and design it as a creative gift.
" 3. How to create your personal Pixum Photo Book in a few simple steps"
Click on "Start Online Designer" in the Online Designer area. This will take you to the online software where you can create the photo book. Select the desired format (portrait, landscape, square) for your photo book from the overview page. In addition to the format, paper type, cover and binding can also be specified. After you have selected the options, click on "apply". To select your photos, click on "upload" next. The photos you have selected are then displayed in the grey column on the left. Now add photos to the Pixum Photo Book by clicking on a photo. You can add and adapt up to 4 photos per page. In the standard version, 26 pages are available, but you can add additional page packages. Once you have completed your work, click on the orange "Add to Basket" button in the upper right-hand corner. Enter your data in the purchasing process and complete the order. Within a few days you will receive your own personalised Pixum Photo Book by post. Start the Photo World software and click on the category "Pixum Photo Book". 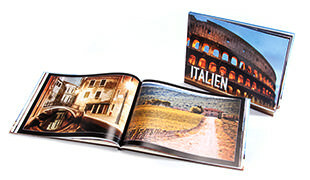 You get to the extensive selection of format and size of your photo book. The next step is to choose the right paper. Choose between premium or photo paper in extra matt, matt or glossy finish. A window opens in which you can choose between a free design or the use of the Photo World Assistant. The assistant guides you step-by-step through the design process, but can be interrupted at any time. If you want to change the binding, cover, format or paper, click on the grey button at the bottom right. This shows the product details including price to give you an overview of the technical details of your photo book. Now the actual designing begins. On the left side, you will find numerous tools for editing your motifs, which you can simply drag and drop into your virtual photo book. If no photos are displayed there, simply change the path of your photo folder with the button "Select folder". Let your creativity run wild and design your own personal photo book! If you are satisfied with the result, then click on the orange "Add to shopping basket" button at the bottom right. In the shopping basket itself, you have the option of checking your photo book again and, if necessary, switching back to the design window if you still have change requests. Otherwise, set the number of copies to be delivered, select a beautiful Pixum Photo Book gift box if desired and click on "Proceed to checkout". After entering your data the order is complete!